BriSCA – cars, grading and race rules - Racewall - fun, exhilarating and dangerous! 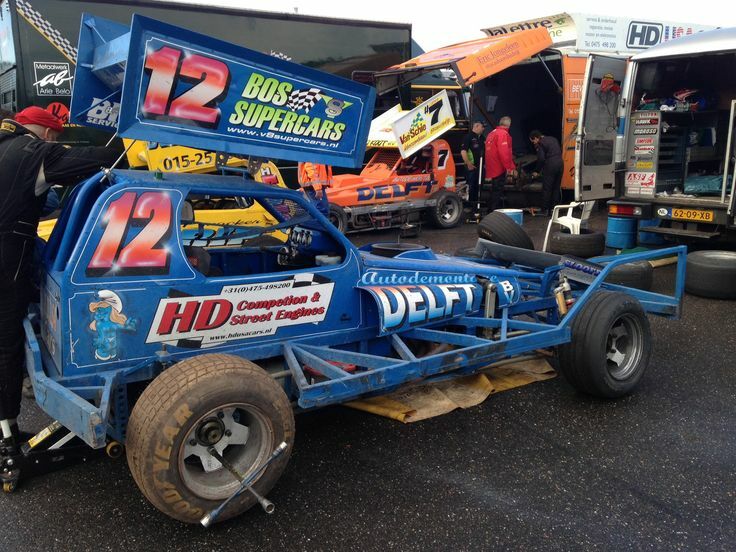 From beginning, BriSCA cars were mostly just standard saloon cars with some features like bumpers and roll cages. Nowdays, BriSCA F1 vehicles, don’t resemble anything they were or cars we see on the roads. The BriSCA F1 cars are front-engine, with a central driver’s seat and rear wheel drive, mostly powered by a custom V8 engines. It’s important to mention that BriSCA F1 cars don’t have limitations or rules-to-follow when it comes to engine choice, but in most cases it’s just a Chevrolet V8 engine, custom built for that particular cars to fit race requirements. Those engines come with 5-7 up to 9 litre capacity and fuel-injectors, turbos and supercharges are not allowed. Most of the cars weight around 1350 up to 1500 kgs. In theory, most of the drivers are allowed and are using two different cars depending on terrain (shale or dirt ovals and tarmac or asphalt ovals). If driver has won more than a few tournaments, its roof top will be colored in mix of those colors. The composition at start of the race is plain simple. At front of the grid are placed higher graded drivers, in middle ones with middle grades being (A and B grade) and at the back are C graders and new drivers. Best of drivers (Superstars, Champions, etc.) are at the front of the grid. Every competition usually has around 60 drivers, and every race around 20. The finals usually consist of around 30 drivers. Use of contact is allowed in BriSCA races and its one of the exciting parts of it. Often mistaken with banger racing, where cars deliberately and hardly crash into each other, in BriSCA most of the drivers apply crashing and pushing in just enough measure to gain strategic advantage. There are few techniques of contact every driver combine druing the race being: push, last bender, nerf, spin and follow in. Green flag: Racing conditions commence or resume. Yellow flag (waved): Racing conditions are suspended; drivers should slow down and maintain their race positions. Any overtaking may be penalised. Yellow flag (static): Usually indicated by marshals to warn drivers of a hazard on the track such as a stationary car. Black flag: Used to indicate to a driver that they are disqualified from the race, usually due to damage to their car. Union Jack: Displayed when half of the race distance has been completed. Lap boards: The number of laps remaining is displayed to drivers so they may understand when to employ a ‘last bender’ (or when to defend against one). It is most typical that the last five or three laps are indicated to competitors. Chequered flag: Shown to the race winner to indicate that they have completed the race distance first. Red flag: Racing conditions end immediately. All cars must become stationary when safe to do so.